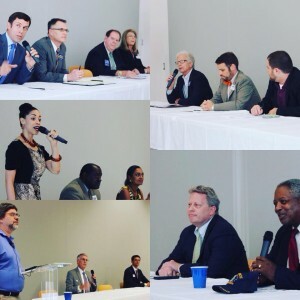 We were proud to support the 2015 Citizens Environmental Coalition (CEC) candidate forum for City of Houston at-large candidates co-sponsored by League of Women Voters Houston and 25 local environmental groups. Several of the questions asked by moderator Charles Kuffner related to issues that we work on, such as expanding recycling and composting city-wide. To provide a brief synopsis of the event, we transcribed the responses about Zero Waste below, and you can also watch the video to hear for yourself what the candidates had to say. After you’ve heard where candidates stand, please take a minute to email all candidates running for Mayor and City Council, asking them to support Zero Waste if they don’t already! Related: Where do Houston Candidates Stand on Recycling? Canvasser in your neighborhood? Why we knock on your door. TCE is registered with the IRS and State of Texas as a 501(c)(4) non-profit organization. See our FINANCIALS. TCE’s sister organization, TCE Fund, is a 501(c)(3) non-profit organization. Contributions to TCE Fund are 100% tax deductible.